Lots of emotions and anger among the AS Roma players after losing for the first time this season, finding it too difficult to overcome Juventus in Turin. Francesco Totti didn’t hide his anger and feelings about the Bianconeri possibly still having more than a slight connection with officials to help them out when necessary, using Gianluca Rocchi as an example. What’s Totti angry about? The two penalty kicks for Juventus. The first, leading to the first goal of the match, was due to a handball by Maicon, possibly protecting his face. The other question was whether or not he touched the ball inside or outside the box. The other penalty in question came after Roma took a 2-1 lead (including a penalty kick converted by Totti, who was also fouled). Paul Pogba was clipped by Manolas, the slightest of touches. It also probably happened outside the box. Rocchi still gave Juventus the penalty kick, which Tevez converted. It’s a huge shame after a good performance. We came to Turin to play our game, but you saw what happened and that affected the match. For years the same old incidents keep happening. I don’t know if we were beaten by referees, but we certainly were not beaten by Juventus tonight. Yes, we are angry, but also aware we are a great team and must lift our heads straight away. This was a match we really cared about, but Juventus ought to have their own League, as by hook or by crook they always win. Are we back to the same doubts? I am not the only one saying this, as these are things everyone in Italy should discuss. With Juventus when there is any doubt whatsoever, it’s always a penalty. I have to stop now, as if I keep talking then I’ll get suspended. 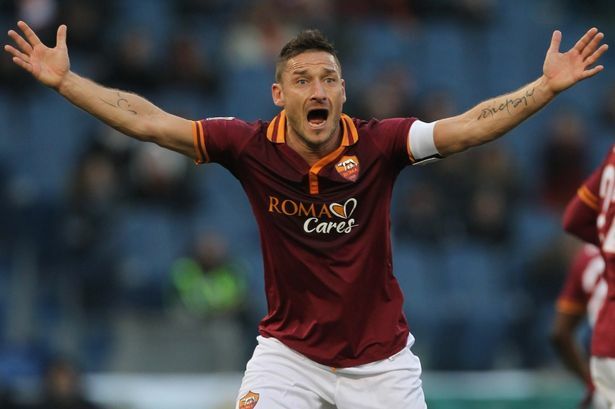 Totti forgot about a few calls going his team’s way, but it doesn’t matter. There was also the red card to both Manolas and Alvaro Morata which shouldn’t have happened, especially on Morata’s part. He made a dangerous slide, but not that dangerous. Manolas on the other hand acted like a thug. Juventus have been punished by what’s happened in the past, which isn’t exactly what people think it is. Other teams got away with less for doing the same. One team has probably been involved but never punished, and may have been behind everything that happened (Inter). Roma were the better team on the day than Juventus, but not by that much. This wasn’t a loss because of officials. This was a loss because they couldn’t get a good, clear cut chance in the second half, and couldn’t stop Leonardo Bonucci from scoring the winner late in the match. Totti will probably get suspended, which won’t help Roma as well.